I’ve often heard people describe something by saying it’s like dying and going to heaven. If you’re pressed for time, you can save yourself the trouble of dying and just go to Tuscany. Head directly for Chianti Classico. This is an area of unbelievable beauty. It has rolling hills with medieval towns perched atop them, green pastures, lush woodlands, vineyards, olive groves, cypresses, umbrella pines, castles, centuries old stone farmhouses, stunning stain glassed churches along narrow, winding cobblestone streets, and ridiculously gorgeous sunsets. The Chiantigiana, or route 222 for those of you with a map, that twists and turns between Florence and Siena is one of the most beautiful roads I have ever driven. Add to this some wonderful wines, bistecca a la Fiorentina (a steak from a local breed of cattle called Chianina), mushrooms from the forest, wonderful cheeses, olive oil good enough to drink, handsome people dressed in colorful, eternally fashionable clothes, an amazing profusion of flowers everywhere, and you have a very enviable way of life. Wine has always been an integral part of the Tuscan lifestyle, on the table at every meal except breakfast, and sometimes as a meal by itself with a piece of bread. A large part of Tuscany is a region called Chianti, and its most important wine takes its name from the region. The Chianti zone is a very large wine appellation, six times as big as the Napa Valley and second in size only to Bordeaux. Chianti itself is subdivided into smaller regions, the biggest and probably most important being Chianti Classico. It has become well known for producing outstanding, food-friendly wines that are enjoyed all over the world, but this was not always the case. Years ago, when most Americans thought of Chianti, they thought of a squat bottomed straw covered bottle filled with rustic, tart, inexpensive red wine that was found in every Italian American restaurant on a red-checkered tablecloth. It was not very good wine but it fit into the bohemian lifestyle and budget that many of us were living at the time. The bottle, appropriately called a fiasco (Italian for flask), was usually recycled into the candle holder of choice for my generation. Given the cost of straw, labor, and the difficulty of shipping a nonstandard bottle, the fiasco has all but disappeared. Being cheap and easy to drink was not a bad thing in those days, but as time went on the wines began to get worse. Part of the problem was the recipe for the wine which dated from the 1800’s. 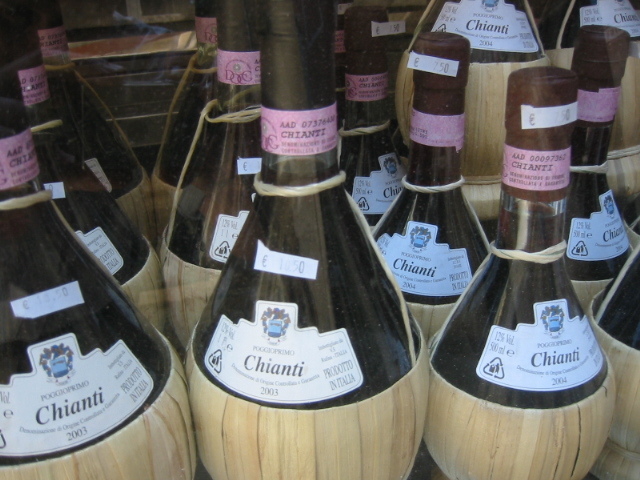 Traditionally Chianti was a blend of red and white grapes. The primary red grape was Sangiovese, a fruity, acidic grape which is native to Tuscany. It was blended with Canaiolo which added color and softer tannins. They were then blended with two types of white grapes, Trebbiano and Malvasia, to further soften the rough edges of the wine and make it more drinkable when young. To keep up with demand grapes were planted all over Tuscany, many in areas not as well suited for growing Sangiovese as the traditional Chianti region. Grapes from Sangiovese clones were even imported from nearby Emilia-Romagna. To make matters worse the Italian government instituted laws in 1967 enforcing the very recipe (10 to 30 percent white grapes) that was causing the problem. The quality of Chianti collapsed. In the 1970’s a few innovative producers began to openly rebel. They simply ignored the laws, known as DOC laws, putting little or no white wine in the blend and bottling their best wines from their best vineyards in Bordeaux bottles and not labeling them Chianti or Chianti Classico. Some of them, lead by Piero Antinori, also began using other grapes such as Cabernet Sauvignon in the blend and aging the wine in small French-oak barrels known as barriques. The inspiration for this was a wine called Sassicaia, a 100% Cabernet Sauvignon from vines brought from Chateau Lafite that broke every rule in the Tuscan book. Sassicaia was initially produced by the della Rocchetta family for their own use. After a few vintages they were producing an amazingly good wine that very few people knew about. One person who did know, however, was Piero Antinori, who was a cousin of the della Rocchettas. He then added small portions of Cabernet Sauvignon and Cabernet Franc, with no Canaiolo or white grapes, to his Chianti Classico called Tignanello. Even though it had to be labeled simple table wine, it immediately changed the perception of Tuscan wine. Other producers followed suit making their own proprietary blends, or pure Cabernet Sauvignons, that were quickly commanding very high prices. The press named these wines Super Tuscans and they started a revolution in the quality of wines from Tuscany. Today the wine laws have caught up with the producers, and wines labeled Chianti do not have to have any white wine grapes in the blend. They can be 100% Sangiovese or can have up to 15% of other red grapes. This presents an interesting dilemma for some of the producers of Super Tuscans who could now call their wines Chianti if they wanted to. In general they have chosen not to do that. The marketing cachet of the proprietary names is just too strong. The Super Tuscans now fall under a new legal designation, IGT, and are no longer called table wines. But the vast majority of the Super Tuscan producers also bottle wines labeled Chianti or Chianti Classico, and today those wines are absolutely outstanding. Tuscany has executed a turnaround in both quality and perception unlike any other I have ever heard of. I recently was fortunate enough to spend a few days in the Chianti Classico region. In addition to just having a great time roaming from village to village, I got a reasonable feel for the state of the wine today. Every wine producer in the region will insist that the Chianti produced there is superior to other regions in Tuscany because the minerals in the soil give it a distinctive flavor. A stone called galesdro in the soil holds water and helps the grapes ripen. Irrigation is not allowed in the Chianti Classico region. The entire area has been designated a DOCG, the highest rating an appellation can have in Italy. It is also administered and controlled by a group called the black rooster or Gallo Nero which enforces quality standards as well as markets the wines. 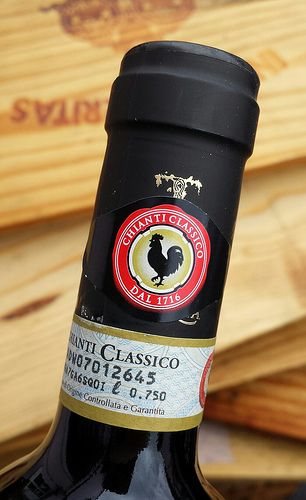 As of 2005 the black rooster trademark was added to the government seal and made compulsory on all bottles labeled Chianti Classico. A few winemakers told me that they are checked twice a year to ensure they are meeting all the standards required of a Chianti Classico wine. Quality is now king. Chianti from vineyards a few miles apart can be very different. Sangiovese is a very difficult grape and tends to produce genetic variations of itself, known as clones. Two of the most famous clones are Brunello, grown in Montalcino, and Vino Nobile grown in Montepulciano. Both are great wines and both are made from Sangiovese, but they taste remarkably different. Another reason for the differences between vineyards is that the endless procession of beautiful hills in Tuscany creates hundreds of different microclimates. Additionally, since there is almost no flat land, every vineyard is on the slope of a hill that might be gentle or steep. Vineyards that are within sight of each other can produce wines of quite different character. You need to experiment a bit to find your favorites. Throughout the area the temperature is warm but the nights are cool. This helps the grapes retain their natural acidity and helps make Chianti one of the great food wines. Sangiovese is less tannic than big wines like Cabernet Sauvignon, but more elegant and lighter than Syrah or Zinfandel. The grape usually has plum and berry flavors and somehow seems to have a touch of salt and spice. Riservas can develop very complex aromas and flavors. This is much more than the spaghetti wine of old. Good Chianti Classico pairs well with meats, cheeses and vegetables of all kinds. It’s a must with the local steak. Tuscan wild boar is a classic match. Even the fictional Hannibal Lechter spoke of eating the liver of a census taker with “some fava beans and a nice Chianti”, so you can be sure that the possibilities are endless. Tuscans still drink more Chianti than anyone else and that is precisely because it goes so well with all the foods of the region. My first stop was Badia a Coltibuono, near the town of Gaiole-in-Chianti. The name translates to Abbey of the Good Harvest and it is a lovely monastery that was founded in 1051. It’s a beautiful place and well worth visiting. The buildings are interesting, the wine cellar is huge and the Abbey garden has recently been restored. It is also home to a well-known restaurant that occasionally hosts cooking classes. Arrangements for tours of the Badia must be made in advance. Benedictine monks of the Vallombrosan Order lived in the Abbey and also planted the first vineyards in the Upper Chianti area. 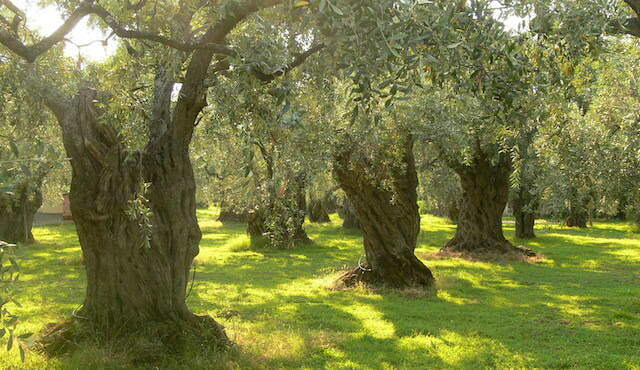 Over the centuries they acquired many thousands of acres and developed a flourishing wine and olive production. I found that many vineyards also produce olives, a tradition started by Badias like Coltibuono in an effort to be self sufficient. Since conditions that are favorable for wine are also favorable for olives, and since the olive harvest starts as soon as the grape harvest ends, this works out well for most farmers. 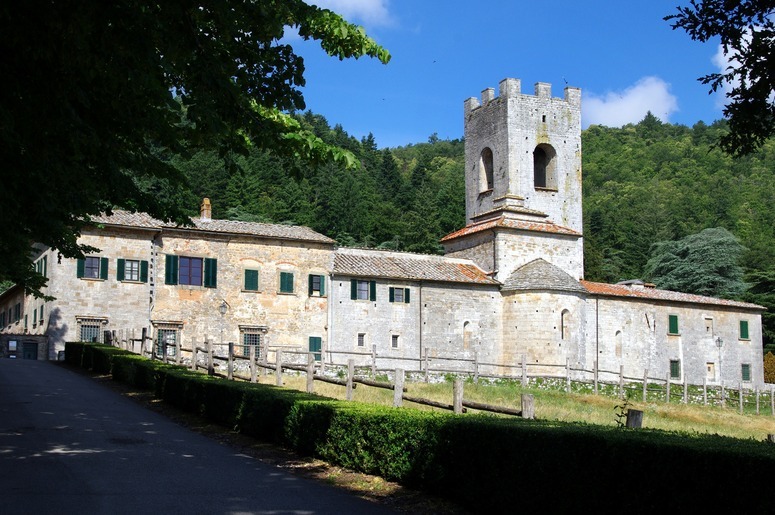 In 1810 when Tuscany was under Napoleonic rule, the monks were forced to leave Coltibuono and the monastery was secularized. The estate was sold by lottery and in 1846 was bought by Guido Buintini whose family owns it to this day. Badia a Coltibuono wines are made from estate grown grapes and are certified organic. They include a Chianti Classico and Riserva, a second Classico called Cultus Boni which is 80% Sangiovese blended with Merlot and two other minor grapes, and a 100% Sangiovese called Sangioveto. Wines offered under a secondary “Coltibuono” label are made from fruit purchased throughout Tuscany and cannot be certified organic. There are also a Vin Santo, (a local dessert wine), and oils, vinegars and grappa. I tasted the Cancelli, a Coltibuono wine with an IGT designation made from 70% Sangiovese and 30% Syrah. This wine is not aged in barrels, only their Chianti Classicos and Reservas are. It was 6 months in bottles and was referred to as a “fresh wine”. It was simple, nice with a pleasant taste but not particularly exciting---an everyday wine for sure. I found many wineries experimenting with Syrah as a blending grape with varying amounts of success. Badia a Coltibuono Chianti Classico 2005 is 90% Sangiovese and 10% Canaiolo, a wine made from traditional Chianti grapes. It was very good, and a 2000 for comparison was denser, more complex and even better. I found myself wondering why they didn’t try to blend some Merlot or Cabernet with the Sangiovese since Canaiolo doesn’t add that much to the blend. But I guess if you’re dealing with a 1000 year-old Abbey the philosophy is probably going to be traditional. The wines were very enjoyable, good examples of what the region has to offer, and have the advantage of being generally available in the US. But there was more spectacular wine to come. Fattoria Tregole, just outside the town of Castellina-in-Chianti, is both a winery and a charming bed and breakfast. The farm has been in existence since 1580. It’s a very comfortable facility with beautiful grounds, wonderful vistas and the home of an exceptional Chianti Classico. 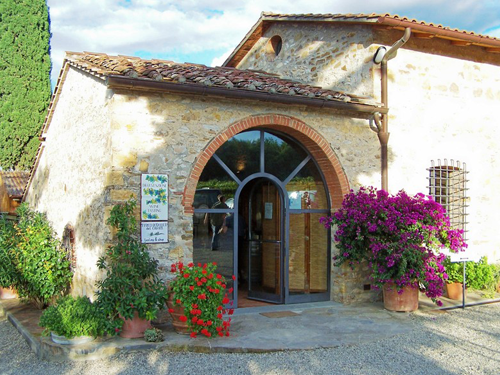 This is where I happened to stay while in Tuscany and I would highly recommend it. Aside from the comforts of the house, staying there gave me plenty of time to talk to Edith, the charming hostess and restorer of the farm, and her husband Catello, the winemaker. They produce about 35 thousand bottles including the Chianti Classico mentioned above which is 100% Sangiovese, and a blend of Cabernet, Merlot and Sangiovese. The blend is, admittedly, a work in progress with great hopes for an outstanding wine this coming vintage. The Chianti Classico, however, is already there. It is a partly oaked wine, blending some oaked Sangiovese with some that was not oaked. The intent is to stop trying to make the wines taste French and get back to the real taste of Sangiovese. Catello, a former architect turned winemaker, is doing that beautifully. It was amazing to listen to him talk about the wine making process. He is out in the fields caring for the plants every day. The harvest is all by hand, common in Tuscany. He spoke of moving the wine as it aged in barrels to rid it of sediment. The obvious care and love for the product that he showed reminded me of the vast difference between a small producer, who can take all these extra steps, and a larger or mass producer who can’t. This was an artisan wine at its best. Tregole is talking to a New York importer now and hopes to export some wine to the US shortly. It will be worth looking for. It will be particularly interesting to see the 2007 when it is released. It was a mild winter and buds appeared on the vines in late March. This should give a long ripening season and the possibility of a very good vintage. Catello pointed me to several other wineries in the area that have a similar philosophy and tastings of those wines confirmed that. Recommended Chianti Classicos include Buondonno, Castello Di Fonterutoli, Le Fioraie and Tenuta Di Lilliano. Buondonno was particularly interesting in that they started blending in a little Syrah into their Chianti for body and color. They wound up liking it so much that they have now bottled 2,000 cases of a Syrah that was quite good but very different than a French or Australian version. Located just outside of Castellina, Casa Emma is a medium sized winery producing about 90,000 bottles and also houses a cooking school. They primarily grow Sangiovese and Merlot with small amounts of Canaiolo and Black Malmsey, a grape I was not familiar with. They use French oak barrels but also buy some from a cooper in Piedmont which they use for their riserva. Barrels are used twice, once for Merlot and then once for Chianti. They told me this adds 2 Euros to the price of a bottle. I first tried their Chianti Classico 2004. It tasted young, bright, with very good acid, soft tannins and tastes of berries and vanilla with real Chianti character. It was a home run that would sell for under $20 in the US making it an outrageous bargain in my opinion. I next tried the 2004 Soloio which is their Merlot. (Casa Emma was one of the first wineries in Tuscany to grow Merlot.) It was very impressive, good to drink on its own, and the oak didn’t overwhelm the fruit which is one of my frequent complaints about Merlots. It, however, was not inexpensive. They estimated it would sell for over $50 in the US. I told them for that kind of money they better get a very high score on that wine. They felt that was possible and then told me that Wine Spectator had given their Chianti Classico Riserva a 90. So I tried the Riserva 2003 which was made from 100% Sangiovese. I could easily run out of ways to describe this wine. An amazing nose hits you at once with berries and vanilla. The wine itself was complex, rich, silky, elegant: pick a word. I immediately told them they were being screwed with a 90 rating. This was simply one of the best wines of any kind that I’d tasted in a long time. It was absolutely stunning, and priced under $30. Just when I thought it couldn’t get any better they opened a 2001. This was even smoother, with more refined tannins and crisp acidity. The taste was similar to the 2003 but had also developed a hint of violets. It was the wine of the year for me. Share your experiences with Chianti Classico! Do you have a favorite producer or vintage? Have you traveled in the region? Share your comment and insights with the community!